What is the oldest surviving English crown doing in the Treasury of the Munich Residenz, home of the Wittelsbach dynasty for centuries? Apparently even the experts are not exactly sure of the sequence of events. But there it is, one of the most beautiful and evocative objects I’ve ever seen. Most crowns considered important enough to be preserved are masculine-looking, as we’d expect in an overwhelmingly patriarchal world. Some of them have a unisex look, suitable for a king or queen, as needed. This crown, known as the “Bohemian” crown, is delicately feminine. It’s made of pure gold, of course. It is enameled and studded with rubies, sapphires, emeralds, diamonds and pearls. It looks lovingly handmade, as no doubt it was. It is quite tall, as crowns and tiaras go: about 7 inches. What I find unique is the airy, open design–not an easy feat to pull off with the many huge gems it holds. The wearer would automatically assume a regal posture, I would think, just in order to live up to this gorgeous object. The crown was made around 1370-80. It was recorded in a list of jewels in England in 1399. Curators believe it belonged originally to either King Edward II or Anne of Bohemia. Anne was married to King RIchard II. But along came his dashing cousin, Henry IV, star of the Shakespeare history plays. He deposed Richard. Eventually, in 1402, Henry’s daughter Blanche married Ludwig III, an Elector–more or less an elected king in what is now Germany. 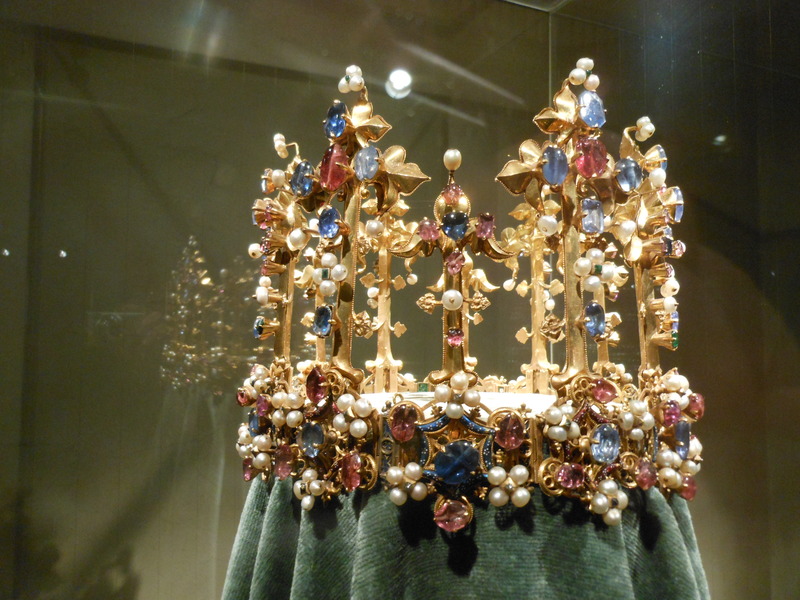 The crown was part of her dowry, so it ended up in the Treasury of the Wittelsbachs. Join me next time for more explorations into the art and history of Europe! This entry was posted in Art, British Isles, England and tagged Anne of Bohemia, Blanche daughter of Henry IV, Bohemian Crown, King Edward II, King Henry IV, King Richard II, Ludwig III Elector, Munich Residenz, Palatine Crown, Residenz Schatzkammer, Residenz Treasury, Shakespeare Henry IV, Wittelsbach dynasty on August 22, 2013 by Claudia Suzan Carley. It looks as though it belongs in a fairy tale, which is where most of us get our info on royalty anyway. Long live fairy tales! Thank you for the comment and the link!